Dow/Olympics – were we misled over cost of wrap? Last year, we and Parliament were told repeatedly that the reason the wrap was being dropped in the comprehensive spending review was to save £7million. That is, the buying the wrap as part of a supply deal would have cost £7million. Well, now it seems that was not actually the case. The Olympic Delivery Authority told me after questioning on Friday that their main contractor, Sir Robert McAlpine, had already gone through their own tender process to find a company to supply the wrap. They confirmed that that company was Chepstow-based Architen Landrell. In fact, Architen had already erected eight test panels on the stadium, which were there for about a year until last month. I have been told that Architen’s official cost for the entire wrap and installation project was £1.5million, which is a touch less than £7million. When I asked Locog about that, they disingenuously said, ‘ah, but the £7million is what had been budgeted for the wrap'(!). Of course, all sorts of questions can be asked about this sleight-of-hand accountancy. For example, if the ODA wasn’t really saving £7million, it has misled the Government and not fulfilled the demands of the spending review. And if there wasn’t that much of a saving to be made, why drop the wrap deal that had already been agreed? Well, perhaps it was because Dow, which had only just signed up with the IOC to become a £75million global sponsor, had been knocking on the door, eager to get to the forefront of the 2012 Games. Of course, mere members of the public can’t scrutinise this because Locog is not subject to the Freedom of Information Act. However, a Parliamentary inquiry might have better luck….so here’s the full version of the piece I’ve done in today’s Sunday Express. AN MP is calling for a full Parliamentary inquiry into Lord Coe’s decision to award Dow Chemical sponsorship of the 2012 Olympic Stadium. Barry Gardiner said yesterday there were grounds to believe the entire procurement process around the deal was a sham. He is writing to John Whittingdale, the chairman of the Culture, Media and Sport select committee, with his concerns. The Sunday Express has discovered that MPs may have been misled by Olympics bosses over the savings to be made from the sponsorship contract. 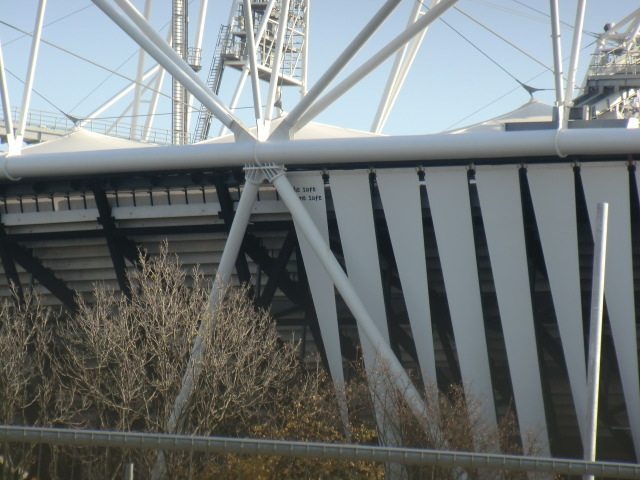 Until October 2010, the Olympic Delivery Authority (ODA) had been in charge of installing a fabric wrap around the stadium. The wrap had been needed to improve the stadium’s appearance and to help gusts of wind affecting the performance of athletes inside. However, the Government then asked the ODA to save £20million as part of the spending review. Games chiefs then said they could save £7million by dropping the wrap. However, the ODA now admits that Sir Robert McAlpine, the main contractor building the stadium, had already awarded a wrap deal to Chepstow-based company Architen Landrell. It is understood that Architen, which had been involved with the 2004 Athens Games, had costed the wrap project at about £1.5million. Anyone revealing those costs publicly was warned about “serious consequences”, the Sunday Express has been told. Architen had proposed a PVC coated wrap that would be cut up and distributed as a souvenir to 20,000 schools around the country after the Games. In fact, for most of this year, eight test panels supplied by Architen had been attached to the stadium as part of the original procurement process. Within a month of the ODA dropping that deal to save money, its sister organisation, the London 2012 Organising Committee announced they had received interest from the private sector to provide the wrap. It is understood that at the forefront of that interest was Dow Chemical, which had only four months earlier paid the International Olympic Committee about £75million to become a worldwide commercial partner. Then last February, Locog, which is not subject to scrutiny of the Freedom of Information Act, announced a new tender for the wrap. Six companies, most of them understood to be British, submitted bids. Locog has refused to say who they were or what they bid, but the suspicion is that US giant and IOC sponsor Dow was always the favourite. The bids were assessed a number of criteria with Locog concentrating in particular whether the fabric would be “sustainable” and recyclable. Dow was announced as the winner in August and Locog now says it was the only bidder not to propose a PVC material. Instead, it will use a polyethylene fabric, which is recyclable. Mr Gardiner said: “The public and Parliament have been led to believe that appointing Dow as sponsor would save £7million. Dow’s position as sponsor has caused anger around the world because of its links to the Bhopal gas tragedy in India in 1984. Although it never owned nor ran the pesticide plant there, it bought the company responsible, Union Carbide, in 2001. Campaigners are demanding more compensation from Dow. A few years ago, I witnessed first hand the huge failings and likely corruption of the family court system as a close friend suffered the life-changing tragedy of having her baby daughter taken from her and handed to the child’s father purely on the basis of the report of a single psychologist. In that case, both parents held UK passports but were living in Valencia as expats when the baby was born. There was a breakdown in their relationship soon after the birth and the mother, during a visit back to the UK, was urged by me and her family to settle back here. She decided to do just that. When she told the baby’s father of her decision, he filed a case under the Hague Convention on International Child Abduction. This convention had not foreseen the increasing number of cases where a child is born in such situations abroad. Because the child was born in Spain, the UK High Court said there was nothing it could do and both mother and child would have to return to Valencia. Once back, the father filed for custody and set about making up a pack of lies and dossier aimed at character assassination. The father, superficially charming, and, unlikely the mother, was fluent in Spanish and worked as a translator with variously well-connected people in Spain. As part of the custody process, both were interviewed by a court-appointed psychologist. The father went first and charmed the “expert” with his tales of woe against the mother. The “expert”, herself relatively recently qualified, then interviewed the mother via a translator by using the accusations made by the father. I have seen the transcripts and so have true experts Harley Street; it was a fundamentally flawed interview. The translator even made several mistakes. The psychologist recommended custody to the father because, unlike the mother, he could speak Spanish, he had a job and a future in Spain, he spoke highly of Spain and he had an apartment there (the apartment he had evicted the mother from). The fact that he had no family there and that the mother could demonstrate a loving family back home in the UK could look after her and their granddaughter made not one bit of difference. Since then, the mother has, against all the odds, remained in Valencia. There is massive unemployment there, yet she has managed to survive by teaching English to students and by forging a very loyal and strong network of good friends. She sees her daughter one Tuesday afternoon a week and once every other weekend. The daughter loves and misses her, despite being fed more lies by the father who has refused every single request for counselling and mediation. For a few years, I had thought that it was just Spain, a country which a little more than three decades ago was a dictatorship and where males dominate. However, after several conversations with Lib Dem MP John Hemming, it became clear the corruption in the family courts and the child protection system exists here as well. He put me in touch with many contacts who have been monitoring this for longer than they had wished. The brilliant Christopher Booker of the Sunday Telegraph has been covering it for decades, although sadly he has been pretty much a lone voice in the UK. I’ve done a couple of articles for the Sunday Express, for example here, and over the past couple of months, I’ve sat in courtrooms and interviewed social workers concerned about what is going on. As the number of children taken into care rises dramatically, it is clear that social workers are under enormous pressure following the Baby P scandal. The current vogue to speed up the adoption process, with David Cameron and Education ministers Michael Gove and Tim Loughton using misleading statistics to argue their case, is just the latest form of political pressure. Tony Blair’s disastrous adoption target a decade ago was to many Labour supporters a more heinous mistake than the Iraq war, they tell me. Anyway, here’s my latest article for the Sunday Express on this issue….and if any other whistleblower, including those from Tower Hamlets and parts of east London, wishes to contact me, they can be sure of strict confidence. John Hemming will raise all these concerns when he appears before the Education select committee on Tuesday. 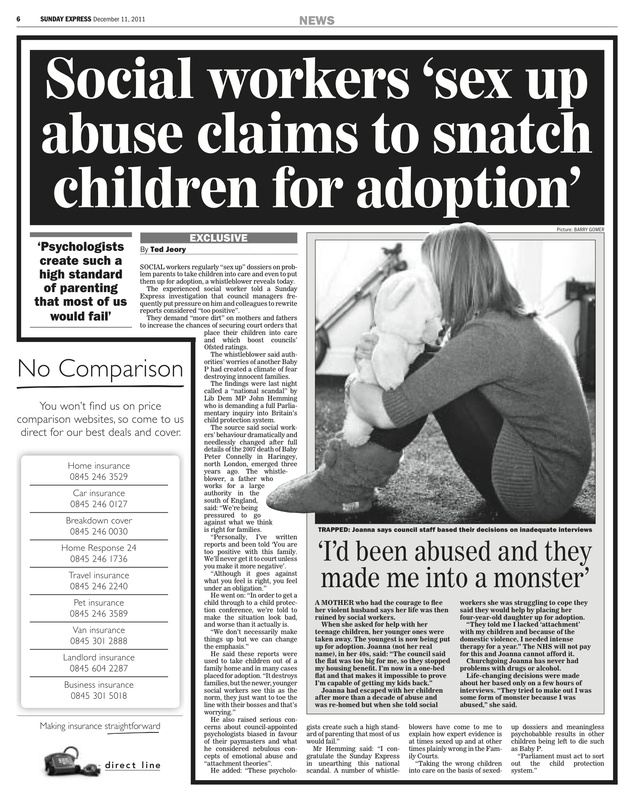 SOCIAL workers are regularly “sexing up” dossiers on problem parents to remove children into care and even to place them for adoption, a whistleblower reveals today. The experienced social worker told a Sunday Express investigation that council managers are frequently putting pressure on him and colleagues to rewrite reports considered “too positive”. The whistleblower said the worry of having another Baby P on an authority’s hands had created a climate of fear that was destroying innocent families. The findings were last night described as a “national scandal” by one MP who is now demanding a full Parliamentary inquiry into Britain’s child protection system. Lib Dem John Hemming will raise the issue when he appears at the Education Select Committee on Tuesday. The committee’s chairman, Graham Stuart, has indicated he would talk to our whistleblower in confidence. The whistlebower said the behaviour of social workers has been dramatically and “needlessly” changed since the full details over the 2007 death of Baby Peter Connelly in Haringey, north London, emerged three years ago. He said there is now a new culture of fear in which the buck of responsibility is continuously passed up the managerial chain. He said people in desperate need of help with their parenting skills are instead having their lives ruined by bureaucrats who fear being blamed for a highly unlikely case of extreme abuse. Courts sitting away from the public glare are then increasingly being asked to make life-changing decisions based on “biased” evidence, he claimed. Latest figures show that social workers, already overstretched due to Government cuts, are dealing with rapidly rising caseloads with 42,700 children now on child protection plans. Social workers say this is largely due to political pressure after the Baby P case. David Cameron has said there are too many children in care and that the adoption process needs streamlining, but critics say the real issue is about why so many youngsters are taken into care in the first place. “Personally, I’ve written reports and been told, ‘You are too positive with this family, we’ll never get it to court unless you make it more negative’. I’ve actually been told that. “Although it goes against what you feel is right, you feel under an obligation. When asked for an example, he said: “In order to get a child through to a child protection conference, we’re told to make the situation look bad and worse than it actually is. “We don’t necessarily make things up, but we can change the emphasis. “It’s subtle. I had one child aged about eight. I’d prepared a report with the emphasis saying that the parents were prepared to make changes and that their attitude was willing. “But then I was told this was too positive, we’d never get it through. He said these reports were used to take children out of a family home and in many cases then placed for adoption. The whistleblower also raised serious concerns about council-appointed psychologists who he believes are biased in favour of their paymasters. In particular, he said he had doubts over what he said were nebulous concepts of emotional abuse and “attachment theories”. 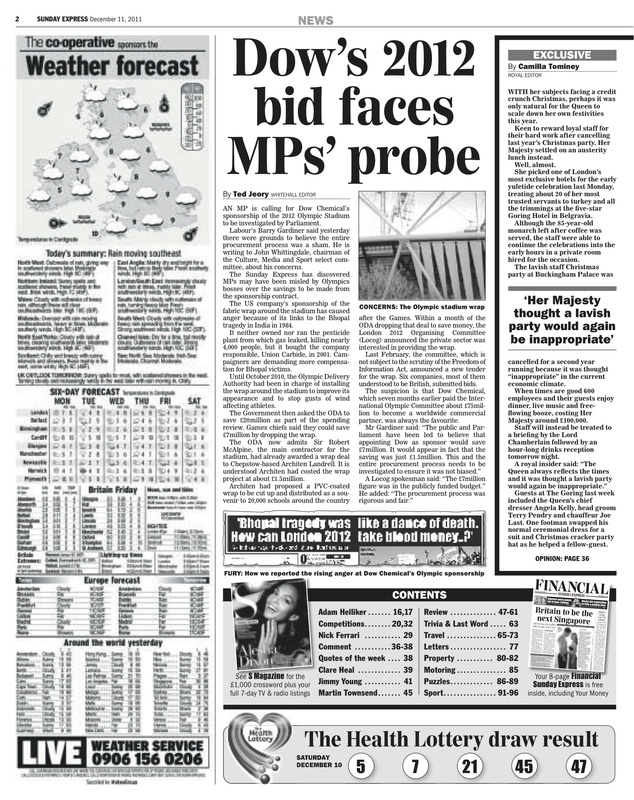 MP John Hemming said: “I congratulate the Sunday Express in unearthing this national scandal. “A number of whilstleblowers have come to me to explain how expert evidence is at times sexed up and at other times plainly wrong in the Family Courts. “Taking the wrong children into care on the basis of sexed up dossiers and meaningless psychobabble results in other children being left to die, such as Baby P.